Sarah and I recently took Milly for a bite to eat at the Lido in Racecourse Road. I was absolutely starving so I ordered their tapas plate. (Ever hopeful!) Sarah followed suit and we both ended up with enormous platters of food which we couldn’t possibly hope to finish. The best were the chick pea and sweet potato (kumera) cakes that were absolutely delicious. Needless to say I bought sweet potatoes and chick peas to experiment the next day and while my experiments were cooking I began leafing through the current edition of Australian Gourmet Traveller. 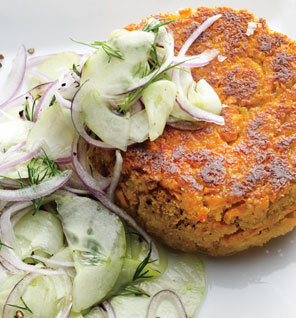 There, on page 54 was a recipe for Chickpea and Sweet Potato Cakes with Green Bean and Mint Salad. Coincidences I believe in, but that was just ridiculous! Cook the sweet potato in boiling salted water for 10 minutes or until tender. Drain well. Using a potato masher or ricer, mash until smooth. Add the chickpeas, flour and spices and mix together well. Mould dessertspoons of the potato mixture into rounds and place on a tray. Heat 2 tablespoons oil in a heavy based frying pan over medium heat and cook the cakes (flattening them a little with a spatula) for 3 minutes on either side or until golden. Keep warm until ready to serve. Serve with natural Greek yoghurt or tzatziki or raita to dip.